Today I'm honored to be a Guest Designer for my friend Shery's 2016 Giving Thanks Hop and Linky Party. I'm sure you know the multi-talented Shery as the owner of the super STAMPlorations company. Several challenges and designers have come together to take part in a Giving Thanks Hop. There are prizes to be won and there is a LINKY PARTY on Shery's blog for you to join in the fun!! Other new bundles are being featured by my fellow Guest Designers. And LOOK, there's a sale!! ONE (1) commenter randomly drawn from our Instagram account will win her choice of Giving Thanks bundle (Be Thankful, Oh So Grateful, or Many Blessings). Commenting ends on November 30 at 11:55 p.m. Pacific Time. ONE (1) winner randomly drawn from all entries linked up will receive the Be Thankful bundle (stamp set with coordinating die, word die, and stencil). ONE (1) winner randomly drawn from all entries linked up will receive Oh So Grateful bundle (stamp set with coordinating die, word die, and stencil). 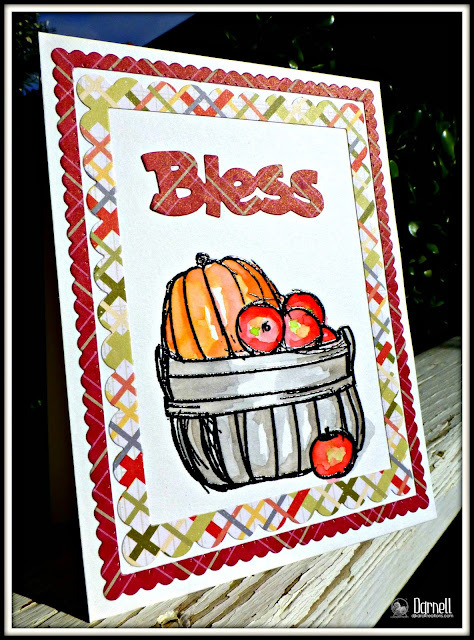 ONE (1) winner randomly drawn from all entries linked up will receive Many Blessings bundle (stamp set with coordinating die, word die, and stencil). in the November Challenges and Hops winners post. Winners have until December 20th to claim their prize. 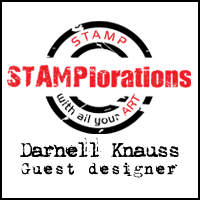 And, lastly, on behalf of my NBUS Challenge, a commenter on this post will be randomly selected on November 30th to win a $25.00 gift certificate from STAMPlorations! Please go to the next stop on the hop to be inspired and leave some comment love! I hope will get the chance to create a project for the LINKY PARTY, too. It can be anything to do with gratitude and thankfulness; it doesn't have to be a specific Thanksgiving project. To add your card, go to LINKY PARTY. Your card feels warm and rustic. I do love the effect of the patterned papers and your card still feels very much CAS. Beautiful! Hi Darnell, Fab card. I love the colours. Fabulous fall card Darnell, congrats on being asked to participate in the hop! LOVE these borders and the papers used. Thanks . Beautiful fall card. I like your coloring and the die cut Bless. I love this sweet basket....and how smart to stretch that sentiment by cutting it! Beautiful fall card! Fabulous card Darnell. Love the way you colored with the Ziggs. So lovely with those patter papers that go together so well. The papers are so beautiful and I love how you coloured the basket in grey! Beautiful card Darnell, love the rustic look of the basket of apple and the background! Beautifully watercoloured card Darnell. Love the scallop frame and the coordinating pattern paper. So happy to see you as part of the hop. I love what you've done with the bundle, Darnell! And that patterned paper works beautifully! It's been fun joining in with all the talented designers on this hop. YAY, congrats on guesting Darnell!! You have created a little country work of art here. Love the layers of plaid and the pretty basket of produce. Marvelous card!! Congratulations on your guest spot and I must say your card you made is super gorgeous! Wonderful card design. Great looking card! What a nice linky party and your card just sets everything off wonderfully. Love your coloring and the layered panels look awesome! Wow!! such an awesome card! Those papers in the background and your design is great. Wonderful card! Loved the layers! What a striking card Darnell - love the bold colours and the big, bold Bless! I love the watercolouring Darnell, you hide your talent for this art stuff behind your talent for the words! Wow! Such amazing card!!! Absolutely stunning!!! Oh my I LOVE your watercolouring! Your card is beautiful!! Some gorgeous entries there too and Congrats on your GD spot! Love this! It evokes a feeling of coziness and I can almost smell the cider. We are blessed to feel your kindness and generous spirit, Darnell. Thank you for being wonderful, glorious you! Congratulations on the Guest Designer spot, Darnell. Gorgeous card, as always. I love the way you colored the image and the bit of plaid papers is just the perfect accent! Great card! Love the watercolour look! Great card. Your card is very well done! I love the watercoloring on it. Beautiful card Darnell..Love it totally.. This is beautiful. Love the sweet layer of plaid and your wonderful focal point image. i love the simplicity of this stunning card. The basket and bounty are beautifully colored and I love the frames! TFS! I really like the watercolor look of this fun card, and the plaid background has the perfect matching colors too! wow, such an interesting card, I love your colouring. Love this card! Love the pp and the coloring! Oh love the fun papers and how you used them! Always a pleasure to see your creative projects! Congrats on being a GD, Darnell! Love your Thanksgiving card--need to use my Ziggies again! Your card is beautiful Darnell! Loved the coloring. 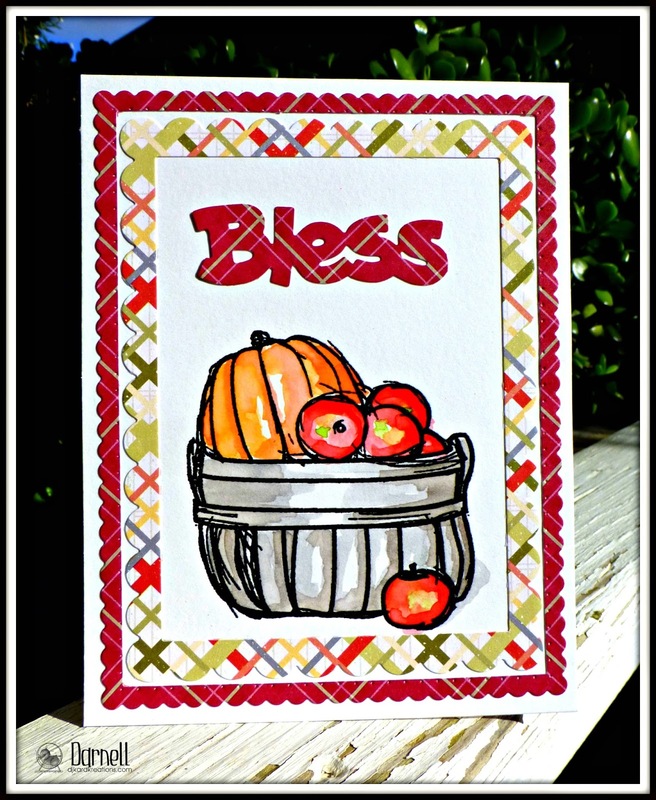 The plaided background goes so well with the harvest basket! So glad you joined us at STAMPlorations hop! Pretty card! I love the setting in which you've photographed it, too. It all looks beautifully rustic and autumnal. You rocked the colouring on this one Darnell and what a fab idea to use part of the sentiment die-cut... inspired! But then, I never expect anything less than genius from you! What a pretty card this is Darnell! I love the colors in the plaid papers you've used and that apple barrel image is so sweet. Super festive!! I love all the fall colors you have used. The pumpkin in the apple basket adds so much color and fun! I really like the double plaid backgrounds and using one for your sentiment on this lovely card! Sorry I missed playing along! Fabulous card...love the plaid background and LOVE, LOVE, LOVE your ziggy coloring! You've totally channeled your inner Shirley on this beauty! Cute card, fun DP you used. Wonderful paper choices for the double mats. Love their warm glowing contrast to the cooler grey shades of the barrel. Very pretty card. Love the pretty papers you used and the artsy water coloring. Love the way you watercolored the harvest basket! Beautiful card! Pretty layering too! Great card love your use of patterned paper. Loving your choice of PPs, Darnell, and how well they tie in with your Ziggie colored image. I am blown away by how beautifully you watercolored that image! And the PP frame it so nicely! What a cozy and rustic card, with the double frames and warm autumn colors. Love that you used just part of the sentiment to fit your design! Thanks for sharing your cute card with the basket of apples and pumpkins! Have a wonderful Thanksgiving, in whatever way you spend it! This is one yummy apple basket! Love that scalloped PP frame - make it look extra special! Enjoy your Thanksgiving and all the best to you and your Mister! I love the patterned papers you used here, Darnell, and your Zig coloring is fantastic!! Gorgeous! LOVE the colours and colouring of your harvest basket, LOVE your pretty layers too!!! 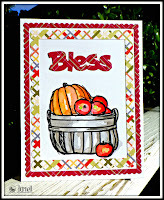 Fancy a Die and stamp set with such a lovely theme on blessings, for truly we are so very blessed of God where we live. Great card too Darnell, love the CAS creation!! Darnell, your card is GORGEOUS! Hi, Darnell! Great card with lots of lovely layers. I really like the patterned papers you combined and the 2 die from W&W and PTI work great together. Thanks for visiting my blog. Your comment was as fun and encouraging as ever. BTW I made the bunch of cards for a private challenge with 4 friends, so I was combining 2 commitments. :) I'm late in sending them now, though.....looking forward to being on the other side of the pond. Getting stuff in the mail will be much easier. Lovely card! The patterned paper is so pretty and adds great effect to the card! !